In demo account, you can see real data of a female tennis player, who has started to play ITF Futures tournaments in the fall of 2017. Before that, she played on ITF Junior Tour. Her highest ITF Junior Ranking in 2018 was 127. She has started to use the Armbeep System at the beginning of the year 2018. Before logging in, please watch our introduction. The wrist monitoring device measures her active time on the court. Active time is the accumulated time of all of her rallies (matchplay) or active phases* (practice). *In practice, the new active phase will start if the break between two shots is longer than seven seconds. By knowing the total time and the active time, you can calculate the work/rest ratio as the percentage of total time. Studies show that in a tennis match the percentage of active time varies from 25-35% of total time. You can see all the data on total time and active time for each day in a graph. The upper line in the graph represents total time. The height of the square represents active time. The value in/on top of the square shows the average number of shots per rally/active phase that day. This value is significant because it tells you a lot about the context of the practice. You will see the calendar in the upper left-hand corner. Choose the period you want to review by selecting that date. On the right-hand side, you can choose between the weekly and monthly view. Start with the monthly views first. 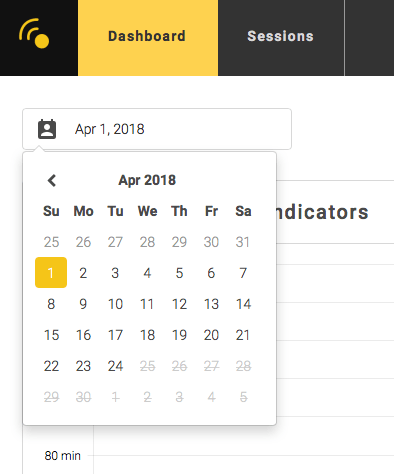 In April 2018, there are no activities until April 8th. Our tennis player has returned from the tournament on April 1st and started a short transition period with one week of fitness training. She has started her regular tennis practice on Sunday, April 8th. 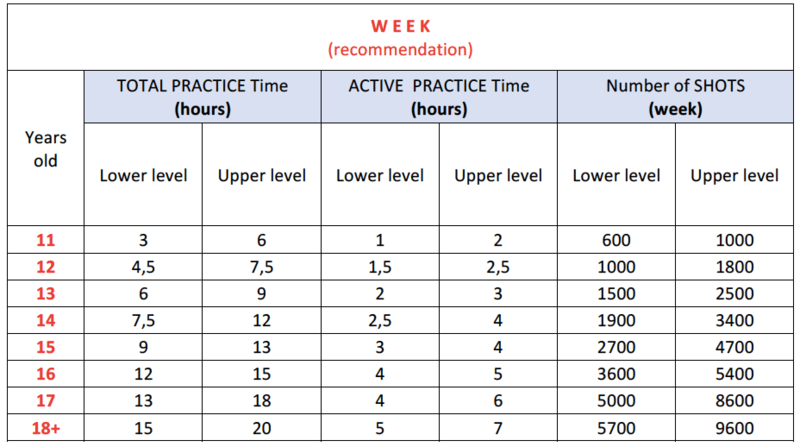 During the period from April 8th to April 19th, she practices 10 hours and 23 minutes. 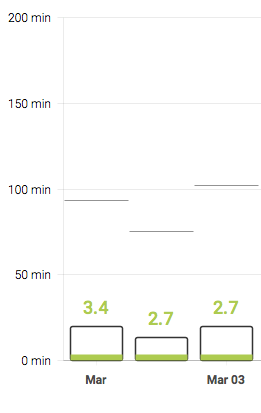 Our player was in the yellow zone on April 8th when she completed her short fitness and conditioning training block. That shows that fitness workload was optimal. During the period from April 14th to April 17th, she participated in a spring training camp where she practiced two times a day. The increased tennis practice and fitness volume caused the change for the worse of her HRV index. In March 2018, she had three days off (March 4th-7th). After that, she started with practice and preparation for the next three ITF Futures tournaments. In March, she competed from March 14th-April 1st. Total time was 31 hours and 51 minutes, while active time was only 8 hours and 2 minutes and was much lower than the previous month. 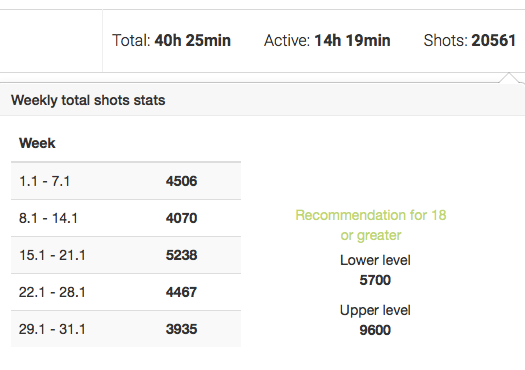 The total number of shots was similar, 12,674. We can see that in February 2018 she spent less time on the court: total time was 29 hours and 13 minutes, active time was 8 hours and 20 minutes, a total number of shots was 12,641. 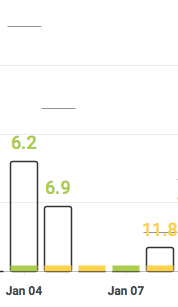 The reason for the reduced overall volume and lower number of shots this month was that she played two ITF Futures tournaments, one from February 20th–27th and the other from February 27th-March 4th. 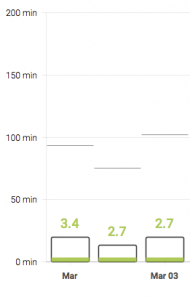 Monthly view of January 2018 shows that our player spent on the court 40 hours and 25 minutes. That is her total on-court time that month, or more accurately, the total time when the wrist monitoring device was on. In January her active time was 14 hours and 18 minutes. Wrist monitoring device also registered all the shots executed in January (20,561 shots total). Comparing the January values with February and March values indicates a fairly large difference in total time, active time and the number of shots, which is in line with the theory of tennis training. 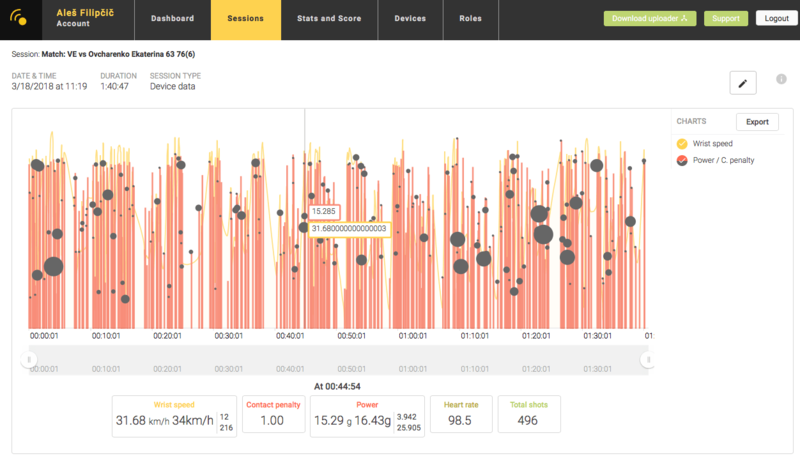 By knowing the HRV index coaches can monitor and modify daily the intensity of practice of their players. 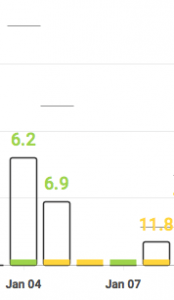 For example, at the beginning of January 2018, our player started the preparatory period; for a few days, the values of the HRV index were in the yellow zone. Therefore modification of the training program and two rest days was needed to avoid potential injury. 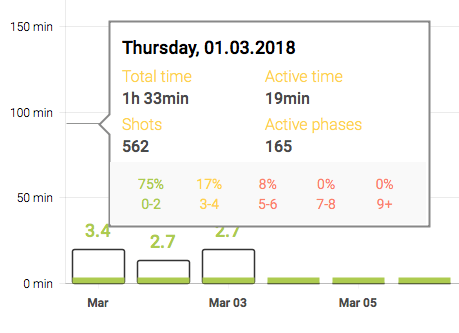 In monthly view can find our player’s performed and recommended weekly values for total time, active time and the number of shots. In the table below you can find the recommended weekly values for total time, active time and number of shots per week for every age group and every skill level. 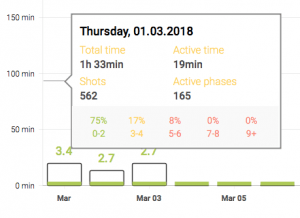 You can also monitor the same data – total time, active time, number of shots, number of rallies/active phases and the average length of active phases weekly. Under Workload, you can review a specific training session or a match. Let’s use the match from March 18th, 2018, which lasted 1 hour and 40 minutes as an example. The final result was 6-3 7-6(6), our tennis player executed 496 shots, the average value of heart rate was 98.5 bpm. You can also review the wrist speed and power (acceleration) of each shot. Contact penalty describes the impact of vibrations on the wrist during the execution of an individual stroke. In conclusion, we can say that Armbeep Tennis Performance Analysis System has many benefits for the coaches and players alike.